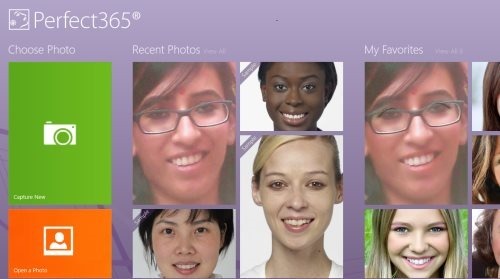 Perfect365 is a free Windows 8 virtual makeover app available under the ‘Photo’ section of Windows 8 app store. 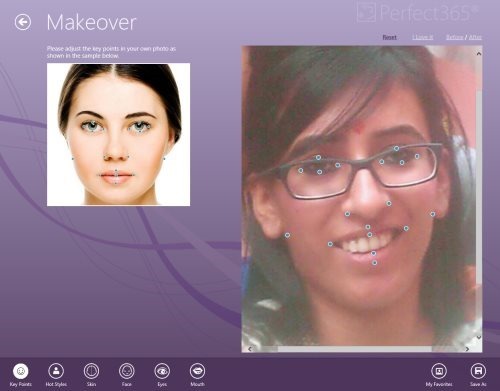 This virtual makeover Windows 8 app lets you apply a natural touch-up or a stunning makeover to your simple face. You can simply select a makeover style and apply it in just a single click or you can tune into a personalized makeup to get an amazing makeover, right on your Windows 8 system. Virtual makeup works towards grooming your skin, face, eyes, and mouth. You can choose from the default photos to try out the virtual makeup kit, or upload a photo from your Windows 8’s local machine, or just capture one from within the app, using the ‘Camera’ option. Also, there are columns for recently used photos, and your favorite photos. You can choose from different colors for your mouth, you can change your eye color, apply foundation, brighten skin texture, apply lipstick of your choice or just select a complete style from ‘Hot Styles’ option. Once you are done with your makeup, you can now save it to your local machine, or just share it with others. You can also add a picture to your favorite list by clicking on ‘I Love It’ button. Also, your can check ‘Before / After’ changes. Let me quickly point out the main features of this Windows 8 virtual makeover app below. Lets you apply a stunning makeup to your simple face. It works towards grooming your skin, face, eyes, and mouth. Lets you upload a picture from the local machine, capture one from within the app, or just pick an image from the default ones. You can easily change your eye color, apply foundation, brighten your skin texture, apply different styles of eyeliner, and much more. Lets you add a picture to your favorite list or save it to your local picture library. Lets you view ‘Before / After’ changes. Lets you share a groomed image with others, from within the app. Well.. I really liked this virtual makeover app for Windows 8. You can try out different styles of makeup, in case you do not have time for doing it in real. Use the entire makeup kit, or just select a makeup style and get your makeover in a single click. It’s a must try out app for those who are into styling out new makeup everyday. Also, check out our posts on Recipe Apps, Photo Editor, and Social Networking Apps. Open this given link only in IE10. Click on ‘View in Windows Store’ to get it opened directly in the app store. Moving ahead, you can now install it to your system and soon the app will get placed in ‘’Start Screen’. In short, Perfect365 is a good fun app designed especially for women. They can work upon their dull face and make it refreshing everything. Well..you can make it your Facebook profile pic, if comes out to be awesome. Go ahead and download Perfect365 Windows 8 app now..